Hoping to find an RV camping destination where you can learn about America’s past along an epically beautiful lakeshore? Why not venture north to Michigan’s Upper Peninsula and learn how copper mining shaped the region along the Copper Country Trail? It’s one of America’s National Scenic Byways, and a route where fascinating history, splendid landscapes and excellent campgrounds come together for a trip you’ll long remember. To give you the overall picture of Michigan’s Copper Country, let’s start by saying that it lies in the Keweenaw Peninsula, that finger of land jutting into Lake Superior at the top of the Upper Peninsula. The Copper Country Trail is a 47-mile section of US-41 that runs from Houghton, Michigan to Superior’s shores at Copper Harbor. The Keweenaw is about eight hours north of Chicago on I-90. It may seem like forty-one miles of byway isn’t worthy of an RV camping vacation, but once you’ve discovered the beauty and historic significance of the Keweenaw Peninsula, you’ll find yourself wishing for more vacation time. What Can We See and Do Along the Byway? Let’s cover a little history before we highlight the wonders of the Copper Country Trail. From 1841 to the Great Depression, copper mining was the main economic force of the region, with a high percentage of America’s copper output being mined there. Immigrants from many countries arrived to mine copper ore, run the businesses that supported the mining industry and share in the economic upswing. As with other industries at the time, however, the 1930s brought the collapse of copper mining and the closure of the last mine. But that’s not to say that you won’t find plenty of evidence of this region’s copper-laden history as you travel the Copper Country Trail. We start our journey in the city of Houghton, MI, the perfect access point to the Keweenaw Water Trail. This series of lakes, rivers and canals cuts across the peninsula to connect to Lake Superior at both ends. It was an important addition to the region’s ability to ship copper to other parts of the country, and is now a nationally-recognized water trail for kayak and canoe paddlers. There are lighthouses at both ends of the water trail, as well as developed and primitive campgrounds and access to inland trails along the way. Travel north from Houghton along the Copper Country Trail (US-41) to find Keweenaw National Historical Park, an expansive collection of museums, mining-related buildings, historic mining towns and visitor centers that tell the tale of the peninsula’s past. At the southern end of the collection is the Quincy Unit, where you can tour Quincy Mine on a cog rail tram and walk the historic village streets to explore a blacksmith shop, a mine office and other structures. Farther north along the Byway, you’ll arrive at Calumet, MI, where the Calumet & Hecla Copper Mining Company brought unrivaled prosperity. Many of the historic structures built during the copper mining boom remain and can be located on the self-guided Calumet walking tour. Visiting these villages and mines will certainly give you a better understanding of the Keweenaw’s past, but the present-day beauty of the area will also capture your imagination. All along the National Scenic Byway, you’ll find mountain lakes and lush, tree-studded hillsides sweeping upward to tempt your eye. When you reach road’s-end at Copper Harbor, there’s still more to discover. A visit to Fort Wilkins Historic State Park offers a restored 1840s military outpost, a developed campground and the chance to tour Copper Harbor Lighthouse. For RV travelers who enjoy a good hike, the Copper Harbor area is an outdoor wonderland! Just a couple of suggestions to get you started: for a short walk in the woods, consider the 1-mile Cathedral Grove Trail through the oldest white pines in Michigan at Estivant Pines Nature Sanctuary. To fully appreciate the rocky Superior shoreline and the coastal forests that surround it, hike the trails at Keweenaw Shore Nature Sanctuary just east of Brockway Mountain. And speaking of that high point along the Superior shoreline, be sure to treat your fellow campers to nine miles of breathtaking scenery along Brockway Mountain Drive from Copper Harbor east to Eagle Harbor. The entire drive is awe-inspiring, and a stop at the top promises full-circle views of Lake Superior. Where Can We Camp Along the Way? Besides Fort Wilkins State Park campground at the northern end of the Copper Country Trail, the peninsula offers many camping possibilities, from private lakeside resorts to basic state park campsites. The City of Houghton RV Park along the Keweenaw Water Trail accepts self-contained RVs, with quick access to downtown Houghton, the Water Trail and an adjacent city park. The Village of Lake Linden Campground, north of Houghton and just east of US-41 on Torch Lake, is also adjacent to a village park, within cycling or walking distance to shops and eateries. McLain State Park, west of Calumet, is right on Lake Superior, with a modern campground, hiking trails and a sand beach. One more tip for RV camping along the Copper Country Trail—Lake Fanny Hooe Resort in Copper Harbor is a popular place to stay while enjoying the sights at the trail’s northern tip. For camera-grabbing views, interesting historic sites and friendly, scenic campgrounds, Michigan’s uppermost peninsula takes top honors. Be sure to send us your favorite memories as you travel by RV along the Copper Country Trail. When you are finished with your RV excursion through the Lower Peninsula of Michigan, it’s time to head north to the Upper Peninsula where the colors will soon reach their peak. The reds and oranges will be peaking in the middle of the month, so plan your trip as early as possible. Your last stop was the Arcadia Marsh Nature Preserve and spending time here was a lot of fun, but it is time to move now before you miss the best fall colors that Michigan has to offer. Drive east to the middle of the state where you can catch Interstate 75 north to the Upper Peninsula. St. Ignace, Michigan signals your entrance to the Upper Peninsula and the opportunity to enjoy marvelous fall colors. While here, make a trip to Castle Rock where you can climb up 200 feet for some incredible views. You also should visit the Straits State Park. This isn’t a huge park by any means, but you can hike, have a picnic, and if the weather isn’t too chilly, take a swim. Views of the Mackinac Bridge with the boats moving along the Straits are quite inspiring. You’ll find RV camping here too! To continue on your journey, you will take Highway 123 through Sault Ste. Marie State Forest Area. This is where you will get to observe the changing colors as fall weaves its way across our continent. During the winter months there are ski trails throughout the region, but in summer and autumn you can ride off-road vehicles here to your heart’s content. Moving on and stopping every so often to do a mini-photo shoot to capture the beauty of this land, you will come to the little town of Trout Lake. Use the lake for some of the best water activities you can imagine. Canoeing is fun but waterskiing is even better! Fish for… you guessed it – trout! You will find RV camping here at Trout Lake offers many amenities that will make your stay a total pleasure. Sixty sites have electric hookups and there is a dump station too. When ready to carry on with your RV adventure, keep following Highway 123, with Tahquamenon Bay to the east and you will eventually come to Tahquamenon Falls State Park. This is another perfect location to enjoy some recreation. There are a number of hiking trails anywhere from one mile long to over seven miles in length. RV camping is available as well. Paddle the Tahquamenon River with lovely views of its waterfalls. One of the largest waterfalls east of the Mississippi river is right here in the park – the Upper Falls. It falls almost fifty feet and is more than 200 feet across. You can turn around now if you can bring yourself to go home. The combination of outdoor fun and fall foliage certainly has made this an awesome trip and it is hard to let it end. Come back again. It will be here next year too! Although the fall colors in Michigan’s Lower Peninsula peak anywhere from late September to late October, you have to travel the Lower Peninsula to reach the Upper Peninsula where the peak fall colors arrive mid-September. A trip up the western edge of Michigan’s Lower Peninsula is worth taking this time of the year, however. You still may glimpse the turning of the trees, but you also get the chance to visit the lovely beaches and parks on your way. Start your fall trip in Grand Rapids. This city has been rated tops for recreation and fun for the whole family. A favorite pastime is to take a chartered boating trip and do some salmon fishing on Lake Michigan. There is a children’s museum if you have kids with you, a beautiful sculpture park (Frederik Meijer Gardens & Sculpture Park) and the Gerald R. Ford Presidential Museum to explore. Everyone loves the John Ball Zoo for an afternoon of visiting with the animals. But you want to get on your way up the coast along Lake Michigan. First stop will be Duck Lake State Park where you can hike or fish all day. All kinds of great adventures await you here. Traverse the terrain at the edge of the lake, climb the towering sand dune, or explore the hardwood forests. The Duck Lake Paved Trail is a half-mile hike worth taking. Five miles north you will come upon the White Lake area and you may find some great gifts when shopping in the fine gift shops. Continuing your trip, you will reach Silver Lake State Park where the family will want to get out into nature, fit in some more hiking time and enjoy the lake in the autumn sun. The weather might even permit a dip in the lake, and there is a beach house where you can change. If you brought an off-road vehicle with you, there are trails to ride. Be sure to stay aware of the changing colors. This should be starting about mid-September. Charles Mears State Park is the next stop. You can fish, hike, swim or have a picnic along the shore of Lake Michigan. 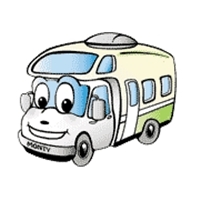 You will find RV camping here with electric service and a playground for the kids. Hike Old Baldy Interpretive Trail for one mile and see what sights there are to see. Off to the east is Manistee National Forest and if time allows, you must venture into the forest and discover all the recreation opportunities. Wildlife viewing is one activity you will want to do while here. You can fish in any of the lakes, ponds or streams and hopefully make a trophy catch. Bird watching is the best in Manistee National Forest. There are more than 400 species of birds that make their home here. The Kirtlands warbler is an endangered species that lives in the forest and you can get a guided ranger tour so you can view these gorgeous birds. Remember, you are actually headed north to the upper peninsula to catch the peak fall colors, but as you go, be sure to stop at Ludington State Park with some great RV camping, and the Arcadia Marsh Nature Preserve farther north so you can experience the coastal marshes. The Great Lakes and Michigan have a lot more to offer than you may imagine. An RV vacation is the perfect way to experience this amazing countryside and the sparkling waters of Whitefish Bay. Starting out in Chicago, you can head north and start an adventure sure to please those of all ages. Driving to northern Michigan to the Lake Superior region, you will take Interstate 75 North. The real start of your journey will be in Brimley, Michigan, but on the way there are some great places to stop. For instance, Mackinac Island is a definite must-see. Once you drive over the Mackinac Bridge, you’ll find signs to Mackinac Island State Park. No vehicles are allowed, so not only is it quiet and peaceful, the views are magical. Another great place to visit for history and one amazing attraction is Sault Ste. Marie. The Tower of History soars 210 feet above the Soo Locks, with observation platforms from which you can see the world’s busiest shipping channel. Take a boat tour of the Soo Locks and witness this shipping lane up close and personal. After all this sightseeing, you are ready to proceed to Brimley. Surrounded by plenty of outdoor recreation, you might prefer to try your luck in any one of the number of casinos. But Brimley State Park should be on your itinerary. Here you will hike, fish or camp along the shore of beautiful Lake Superior. Continue your excursion on West Lakeshore Drive around Whitefish Bay towards Whitefish Point. Lighthouses are always a fascinating sight, romantic and inspiring. The Point Iroquois Light Station and Museum is all of this and more. This lovely spot is a perfect place to experience some of Michigan’s natural history, and a wonderful place to stroll with the family. Climb to the top for some panoramic views. You are now in Hiawatha National Forest, and there is a lot more to do and see here. National forest campgrounds are located at Monocle Lake and Bay View. Wildlife watching, hiking and more history to absorb are here for you in this wooded wonderland. If you love waterfalls, there are dozens to captivate your attention and awe. Continue on Highway 123/Whitefish Rd to get to Tahquamenon Falls State Park. You will simply have to get out and stretch those muscles. You will find many great hiking trails, from short treks of a mile in length on Tahquamenon-Emerson Trail and Tahquamenon-Nature Trail to the longer ones of Tahquamenon-Wilderness Loop (7.4 miles) and Tahquamenon-Clark Lake Loop (5.6 miles). Visit the Upper and Lower Falls for some picture-taking opportunities. When you reach Whitefish, Michigan, be warned that this is fishing country, and you hopefully brought along your rod and reel. And if you’ve come at the right time of year, Paradise will be holding its annual Blueberry Festival. At Whitefish Point, you will certainly not want to miss the Whitefish Point Light Station which has been on duty protecting ships for many years. After this wonderful trip in your RV, you can now head home knowing you have seen the best of northern Michigan’s Great Lakes region and have made some lasting memories. Twin Creeks Campground in Buffalo, Wyoming features game racks, a hunters’ lounge and quality campsites close to Big Horn National Forest. That’s where hunters will find pronghorn antelope, wild turkey, elk, moose and deer in abundance. If you’re heading for the Big Horn Mountains this year to hunt, reserve your campsite in Buffalo before you go. Hunting in Colorado this season? Mt Princeton RV Park in Buena Vista really caters to hunters, with space to process and hang game and affordable campsites every hunting season. A couple of hours south of El Monte RV Rentals in Denver, it’s a prime spot to set up camp while hunting elk and mountain goats in the Buena Vista area. Big game hunters will find state-managed hunting right next door to the RV campsites at Gillespie Ranch RV Park in Mayhill, NM. Elk, deer and wild hogs are just three of the big game species found regularly near the campground. You’ll find this first-rate hunters’ campground four hours south of Albuquerque in the heart of Lincoln National Forest. If you’re headed for Oklahoma’s Kiamichi Mountains this hunting season, book your campsite now at Honobia Creek Store and RV Park. About three hours north of McKinney, TX El Monte RV Rentals, this RV campground hits the bulls eye for excellent wilderness hunting accommodations. Wild hog hunting is popular in this southwestern Oklahoma region, so ask the RV park owners to schedule a guided hunt. Keep an eye out for Bigfoot! One more premier hunting and RV camping experience can be found on Michigan’s Upper Peninsula at Sherman’s Resort on South Manistique Lake. Not only do they offer first-rate RV camping amenities, they also have a guide service for hunters hoping to find black bear or white-tail deer. Duck hunting is another star attraction for this area, so be sure to reserve your campsite early. Haven’t hit your style of hunting with our suggestions? No worries – any style hunting expedition is made easier with deluxe RV accommodations. Pick your favorite hunting spot this season and then contact us to book your RV rental. We look forward to helping make your hunting trips memorable! Well-traveled RV camping fans will attest there are few places in America more beautiful than Michigan’s Upper Peninsula. One of the most scenic drives in that region is along Lake Superior’s Whitefish Bay, reaching from the farthest East Michigan town of Brimley around the Bay to Whitefish Point. If you’re coming north from Chicago, it’s about an eight hour drive across Michigan’s Lower Peninsula, across the Mackinac Bridge to the Upper Peninsula and then up to Lake Superior’s shore in the town of Brimley. You’ll then go west along Whitefish Bay on West Lakeshore Drive, join Lake Superior Shoreline Drive and then go north on Hwy 123 to Whitefish Point, the westernmost promontory on Whitefish Bay. Brimley State Park is a great place to catch your breath if you’ve driven in from Chicago. A modern campground on the shores of Lake Superior is just the beginning of a beautiful day spent learning to love the beauty of the Upper Peninsula. Point Iroquois Lighthouse is just seven miles north of Brimley on West Lakeshore Drive. A beautifully preserved tower and keeper’s dwelling offer unforgettable vacation photo opportunities. Paradise, Michigan is highly-rated by folks RV camping in Michigan as a place to stop and play awhile. Comfortably ensconced on the Lake Superior shore, it offers sandy beaches, access to first-rate hiking and biking trails and an August Blueberry Festival that’s not to be missed! Tahquamenon Falls State Park is definitely worth the twenty mile side trip from Paradise! In addition to several RV campgrounds, the park offers spectacular views of both Upper and Lower Tahquamenon Falls. Active RV campers will want to follow the sixteen mile North Country Trail for the very best views of all. Centennial Cranberry Farm is located between Paradise, Michigan and Whitefish Point near the northern end of your journey. Tour this historic farm to learn how cranberries have been grown since 1876. Great Lakes Shipwreck Museum – Whitefish Point Light Station: Explore a lighthouse built during Abraham Lincoln’s administration and then learn the tragic stories of lost ships in the Great Lakes Shipwreck Museum. Whitefish Point Bird Observatory is the jumping off point for Spring and Fall migrations for tens of thousands of hawks, owls, eagles, falcons and waterfowl. These are just a few of the places that will capture your imagination along Lake Superior’s Whitefish Bay. Let us help you with an RV rental for the trip, and plan to lose yourself in the breathtaking beauty of Lake Superior’s southern shore. On the shores of Lake Michigan, Van Buren State Park is an active RV camping family’s wonderland. With a gorgeous beach, scenic hiking trails and affordable RV camping, this state park meets our seal of approval for a great vacation spot. Just two hours’ drive from Chicago along I-90, the park is easy to reach. Once there, here’s what you can expect to enjoy at Michigan’s Van Buren State Park. Doesn’t it whet your RV camping appetite to read “220 campsites just 400 yards from Lake Michigan?” These up-to-date campsites offer electric hookups (some 50-amp), as well as clean, modern restrooms and showers just steps away. The Van Buren State Park setting is best described as “rolling dunes, a mile-long stretch of sandy beach and beautifully-wooded recreation areas.” You can reserve your Van Buren State Park campsite here. At $22 for the most expensive site, this is definitely a bargain thrifty RV campers will appreciate. One of the best reasons to travel to this Michigan state park is for the chance to travel the 14-mile Van Buren Trail. With a dirt and gravel surface suitable for biking, hiking and horseback riding, it’s a great day trip for active families. The trailhead is located just minutes away in South Haven, MI. The trail is also very affordable, just seven dollars for a family day pass and three dollars for individuals. That pass will also give you access to the 33-mile Kal-Haven Trail from South Haven to Kalamazoo, if you’re planning to stay a little longer. We can’t mention a Lake Michigan campground without mentioning the beautiful beaches! Van Buren State Park’s mile-long stretch of beach is no exception. Lie on the sand beach and while away the day or splash in the waves of Lake Michigan. Photograph the area’s “high dunes” and watch for wildlife and birds through your camera lens. You decide how to spend your time on this state park’s idyllic beach front. The shores of Lake Michigan are a place all motorhome camping families should experience! Book your campsite at Van Buren State Park in South Haven to discover the lure this area has had for campers for more than a century. RV travelers, you simply must plan a trip to Traverse City, Michigan, located on Lake Michigan’s Grand Traverse Bay. This cheerfully scenic city on the 45th parallel is an RV travel wonderland, thanks to the amazing range of experiences available. Whether you’re hoping to attend a wine-tasting at an area winery or enjoy the fall foliage on a scenic drive, Traverse City, MI has everything RV campers want on vacation. When you arrive in Traverse City, expect to be overwhelmed by the area’s visual delights. Lake Michigan itself offers endless waterscapes, windswept beaches and lushly forested shorelines. A favorite destination of RV camping fans is Sleeping Bear Dunes National Lakeshore, where a hundred miles of hiking trails and year-round outdoor activities will keep everyone in your group in motion. Arrive in Traverse City in autumn and the fall foliage will have you stopping to take photo after photo. Scenic drives fan out along Michigan’s Lower Peninsula and showcase the best in area leaf peeping. As you roam the wooded hillsides, plan to take a break for fresh-pressed apple cider at one of the historic cider mills; there’s nothing else quite like it! Before we move on, we must also mention that Traverse City is in the heart of Wine Country! Plan your own leisurely tour to such wineries as Chateau Grand Traverse, Peninsula Cellars and Bowers Harbor Vineyards, or take one of the escorted wine tours offered by local firms. These wine country tours are especially nice in Autumn, when the fall foliage adds even more sensory pleasure to the experience. If you’re hoping for a Fall RV trip that packs in leaf peeping, wine tasting and plenty of outdoor activity, Traverse City, Michigan is your destination. You’ll soon learn why this beautiful city on Lake Michigan is truly an RV travel wonderland.